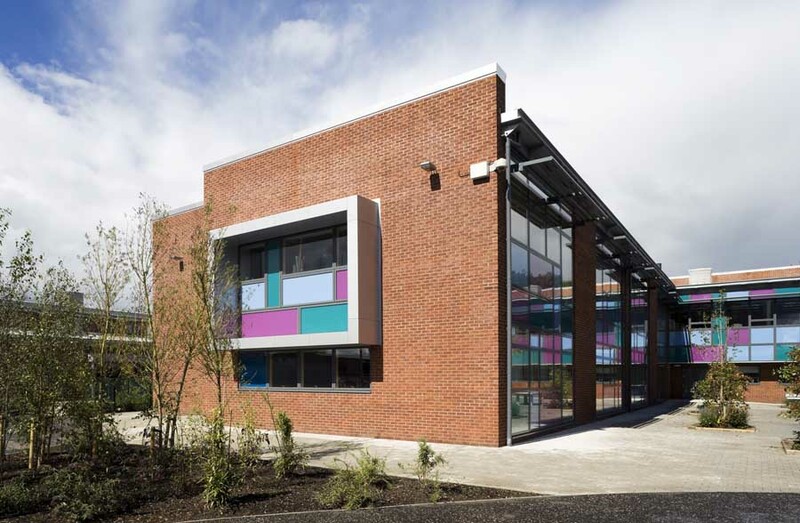 The new Hillhead Primary School has been created to bring together Hillhead, Dowanhill, Willowbank, and Kelvinhaugh Primary Schools including Willowbank and Dowanhill Nursery Schools. 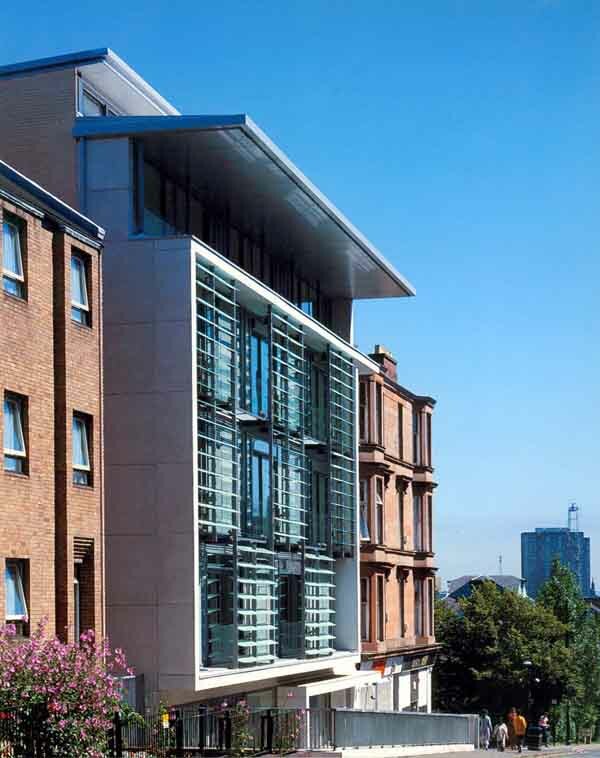 The site is situated on a former gap site at Gibson Street and Otago Street and includes the site of the old Land Services Depot which sat on the edge of Kelvingrove Park. This site is very prominent and was vacant for many years, creating a void space in this part of the west end. It is surrounded by a mixture if buildings; the Anderson Free Church, the Hillhead Congregational Church and tenement properties. 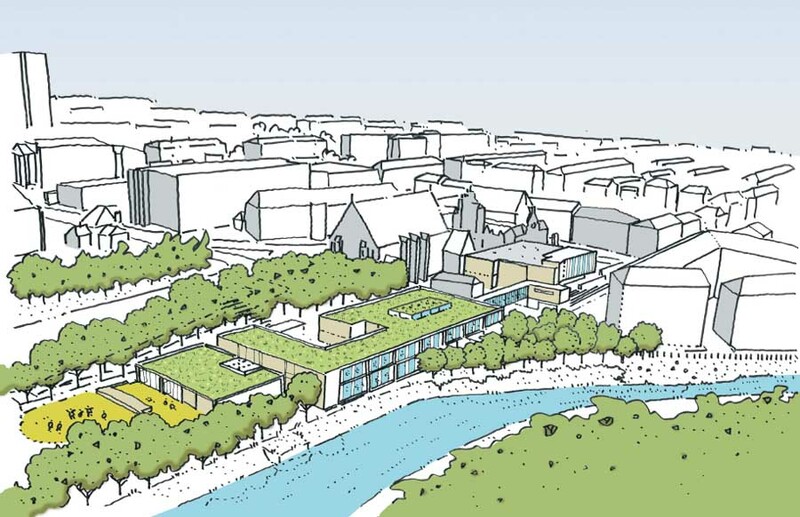 The location of the new school acts like a window to the River Kelvin to the south and the landscape of the park to the west. A significant skyline is also apparent that includes the spire of the University. Our approach was to design a building that mediates between the territory of the park and the urbanity of the surrounding neighbourhood. Using the complex levels of the site we proposed a new plinth to Gibson Street which creates a datum and contains the car parking and servicing. 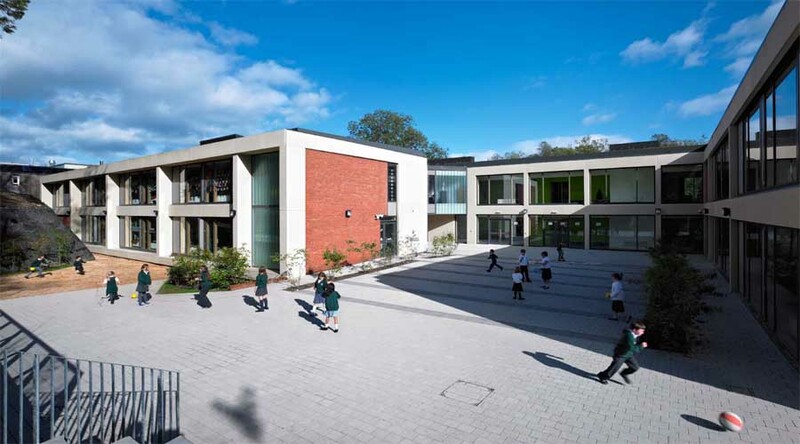 This is topped with an urban box which accommodates the dining and games halls which have the dual purpose of serving the school and community. Set back from the building line this urban box creates an urban square with a civic clock tower. 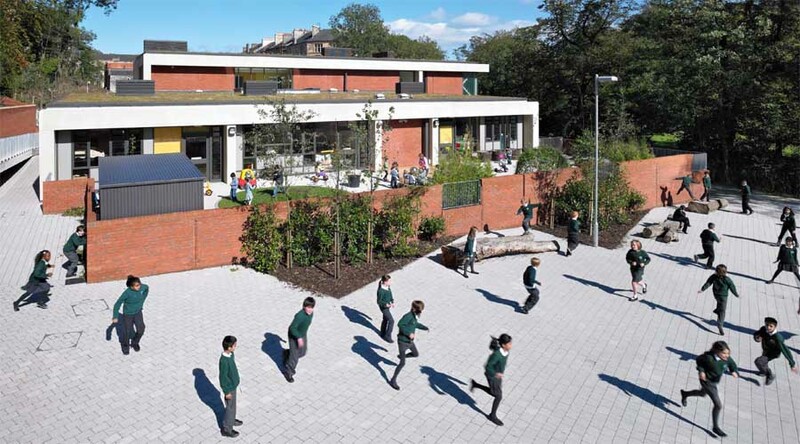 It acts as both a playground to the school but also a potential extension to the public realm for the local community, during the West End Festival for example when the space could be used as a venue for events. The building is elevated in large panels of acid-etched precast concrete in response to the quality of the local masonry. Boundary walls are finished onto the street in blond sandstone and gables and base courses are lined in a textured red brick which relates to the back lanes and mews of the tenement surroundings. The first floor media library is clad in translucent cast-glass and will be a significant feature early morning and evening and a light filled interior during the day. The material celebrates its content whilst respecting the privacy of its occupants. 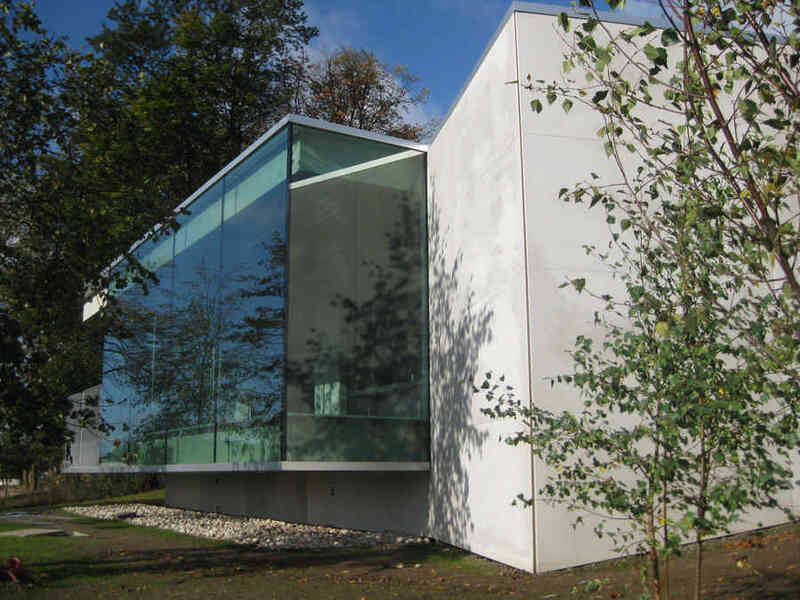 To the south of the site where the building addresses the park the scale and materiality changes; this is the teaching wing and contains the classrooms which have large expanses of glass that take in the views of the park. Natural ventilation has been established with opening vertical hoppers and passive ventilation stacks which populate the roof. 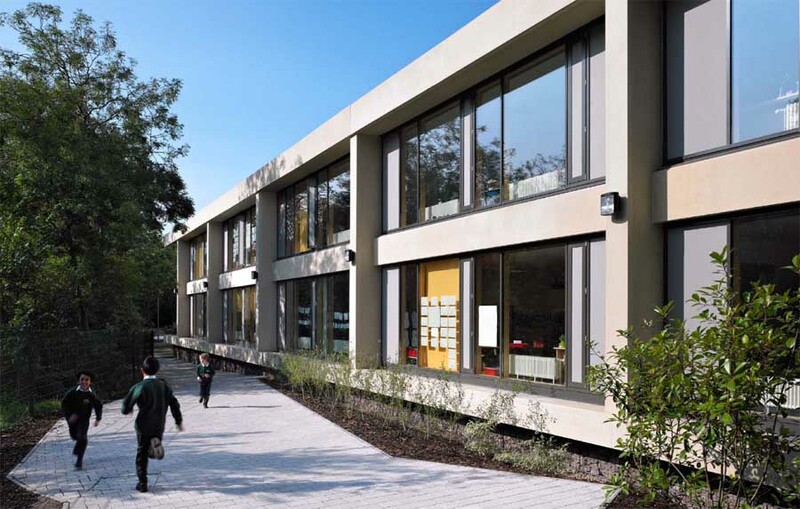 The teaching classrooms gather around a double height social area that is top lit and are arranged with regimented clarity which emphasises the beauty of the natural surroundings. This block is open to the context creating a learning environment that is very much part of the park landscape in which it sits. 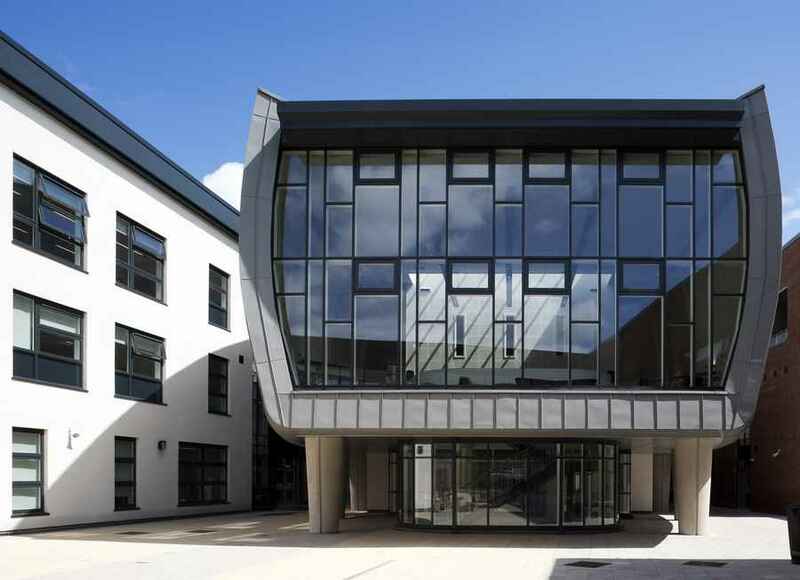 Due to the slope in the site from Gibson Street to the Park, the upper level of the teaching block aligns with the ground floor of the community building onto Gibson Street. 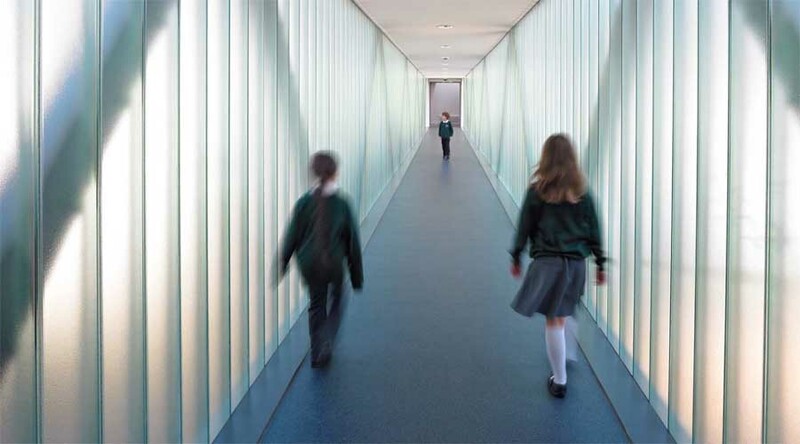 The link between the community building and teaching block is achieved by a translucent glass clad bridge link which glows in the early morning and evening and marks a transient journey between the two territories of the school. The teaching block is covered with sedum which changes colour with the seasons and creates a harmonious link between the school and the park whilst providing environmental benefits. Coloured soffits and textured covered areas highlight entrances and provide tonal warmth. Walls within the site are textured and in the case of the gabions, related to the stones that line the riverside. Details such as the patterned manifestation that adorn the door screens are generated from the ways in which light dapples through the trees that surround the site and are intended to highlight a sensory delight stimulated by the surroundings. The school was asked to facilitate the ‘Curriculum for Excellence’. 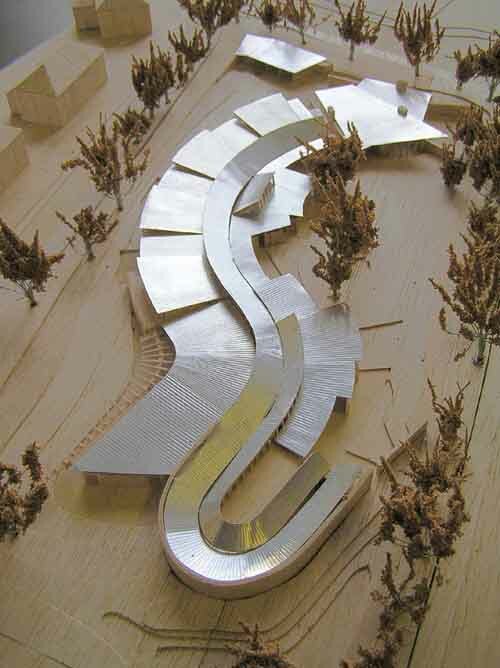 It does this with a solution which is uses the context to inform the design solution; a building dictated by the fundamental natural benefits of the location which has an inherent sense of ‘place’. The school provides the client spaces in which to deliver the curriculum but moreover it enhances the children’s everyday experience through the relationship they have with their community, the sights and sounds of the environment and the passing of the seasons.